Punitive Damages Not Available in IL Wrongful Death Cases | Hupy and Abraham, S.C.
Are punitive damages available in Illinois wrongful death lawsuits? Generally, when you file a personal injury case in Illinois, you can ask for two types of damages: compensatory damages and punitive damages. Compensatory damages are monetary compensation for actual losses, such as medical bills and lost income. They may also include important non-economic damages, such as physical pain and emotional suffering. Punitive damages, however, do not compensate the victim for the injury that has occurred. Instead, punitive damages punish the person who caused the injury. A judge can order a defendant to pay punitive damages in order to punish his wrongful behavior and deter others from engaging in similar behavior. In Illinois, the judge also has the right to decide what percentage of the punitive damages is awarded to the victim. Punitive damages are reserved for cases where the conduct was “intentional” and “willful and wanton.” These damages may be awarded in personal injury case stemming from a drunk driving accident, for example. In Illinois, punitive damages are not available if the personal injury victim dies. This is true regardless of whether or not the victim dies from his accident injuries or natural causes. The right to seek or to recover punitive damages belongs only to the person who was hurt and not to his estate. The Illinois Supreme Court has held that the only way punitive damages can be sought after the death of the victim is if a specific statute expressly allows for the recovery of such damages. 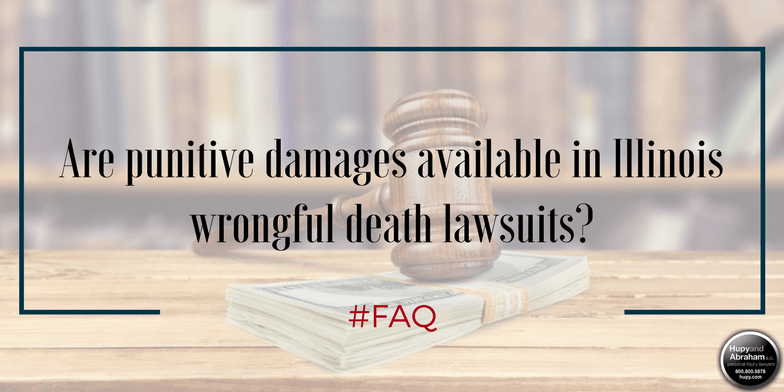 You may not be able to recover punitive damages in an Illinois wrongful death case, but there are still other important reasons to pursue a legal recovery. The other types of damages that you may recover may hold the person responsible for your loved one’s death accountable and may be important to your family’s future. To learn ore more about your rights, please contact us via this website or by phone at any time—24/7/365—to schedule a free, no-obligation consultation with an experienced and empathetic wrongful death attorney. Posted on 03/24/2017 How Do Wrongful Deaths Happen?